Milio’s Sandwiches is a sandwich shop serving gourmet sandwiches on award-winning bread. Founded in 1989 with one sandwich shop in the heart of the UW-Madison campus, Milio’s has grown to 32 restaurants — both corporate and franchise locations— located across Wisconsin, Iowa, and Minnesota. Initially, The Digital Ring worked with Milio’s to optimize their social media accounts. Now, we run all aspects of Milio’s marketing, helping the brand drive sales through email marketing, digital advertising, content creation, and more. We’ve won six American Advertising Awards for the work we’ve done for Milio’s. 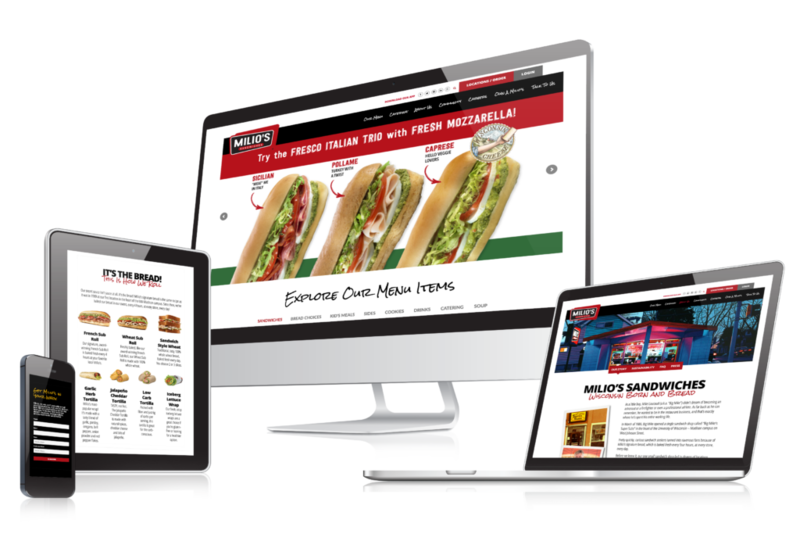 In 2018, we designed and built a new website for the sandwich shop, improving upon the user experience, online ordering feature, and information available on their previous site. The new site has seen a 7% lift in web sessions and a 15% lift in web sales per store. To complement the new site, we also implemented e-commerce tracking that allows Milio’s to measure and analyze all web transactions, which helps guide their business decisions. Check out the new Milio’s site here. Working with The Digital Ring has been beyond my expectations! I love that I have a whole team at TDR constantly ensuring my marketing is strategic and fresh. It adds so much to my business! In response to Milio’s objectives, The Digital Ring helped create a two-part integrated social media campaign. The second part of the giveaway focused on creating positive feelings around the Milio’s brand and garnering brand loyalty. With the help of TDR, Milio’s launched an email marketing campaign gifting all giveaway entrants with a free “Buy One Get One” coupon. Since the success of the 2015 Life is Beautiful campaign, The Digital Ring has taken ownership of Milio’s marketing efforts and continues to create compelling campaigns for the popular sandwich shop.